In 1972, graphic designers Wim Crouwel and Jan van Toorn debated their ideas and beliefs before an audience at Amsterdam’s Museum Fodor. As my interest in design has hugely been influenced by these two designers, I used to draw an imaginary picture of the debate that I could not see for myself in my head, and wondered how the talk between them would really like. 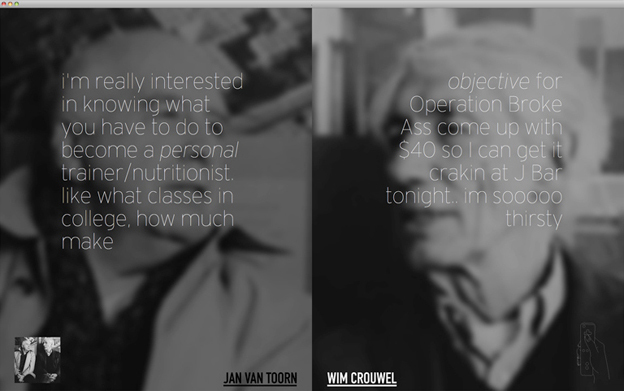 The project attempts to virtually reproduce the debate between Wim Crouwel and Jan van Toorn by real-time internet search on Twitter. There are three keywords set to each designer. Tweet includes these three key words then changes the conversation in real time, as they are posted on Twitter by online users. The dialogue is indeed not the one that the designers actually share each other, but is rather inadvertently reconstituted by Twitter users. It therefore has no direct correlation with design or the designers. Besides, the conversation is individual, meaningless, and turned-on with only a few keywords compose it. The short posts of notification written by many random people also can not comprise the conversation. Ironically, however, the different positions of two sides shows delicacy of their ever-changing correlationship in the conversation. Selected keywords for the search are referred by Peter Bil’ak’s article in Eye magazine.